The road could be closed for weeks. 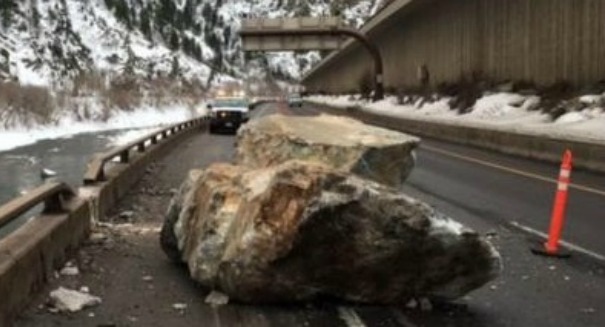 A huge rock slide has damaged three cars and shut down an interstate highway in western Colorado. The road will stay close probably for weeks as authorities attempt to clear the giant boulders. Two large rock slides left boulders the size of cars on the roadway and damaged three cars, forcing motorists to take a detour of nearly 150 miles to get around it, according to the Colorado Department of Transportation. CDOT completely closed Interstate 70 at around 10 p.m. Monday night for safety purposes. The two rock slides happened at about the same spot, on a section of highway west of Hanging Lake Tunnel and eight miles east of Glenwood springs. A semi-truck was caught in the slide, as were several cars, although fortunately no one was injured. All vehicles have been cleared with the help of the Colorado State Patrol. It’s unclear how much it will cost to repair the road and clear all the debris, but it will probably be a while before it reopens. The average daily traffic in Glenwood Canyon, where the rock slides happened, is about 300 vehicles per hour. It is located about 125 miles east of the border with Utah.